Fantastic place to enjoy your holidays in one of the most beautiful places in Dalmatia. The view is for sure the best there is to get in Brela. 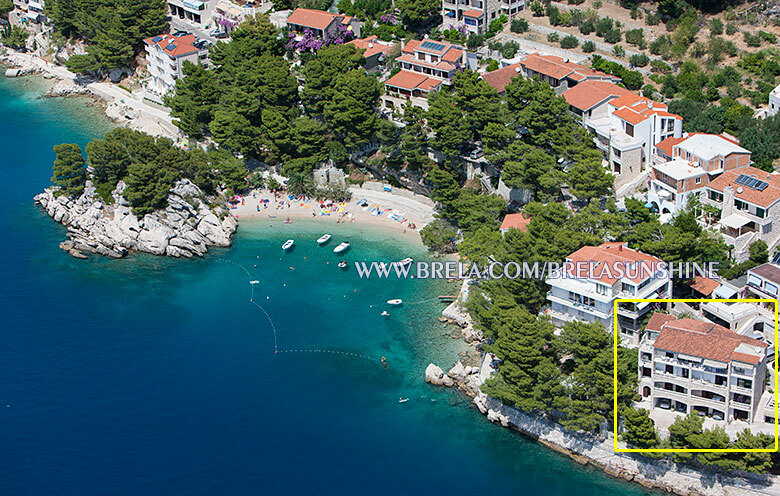 House is built on a seaside and makes one picture together with famous symbol of Brela – Brela Rock, and beach Punta Rata. Sea, sun and scent of souranding pine trees will charm your senses. In front of house there is no traffic, and there is no need to drive a car on this holiday. In walking distance You will find iconic nature, sandy beaches, restaurants and shops. We offer you 5 apartments and 3 rooms with kitchen and breakfast for rent. All units are fully equipped. Upon request units can also be combined to suite almost any arrangement you might have. All accommodation units have: sea view and balcony, air conditioning, wifi, satelite TV and parking place by the house.